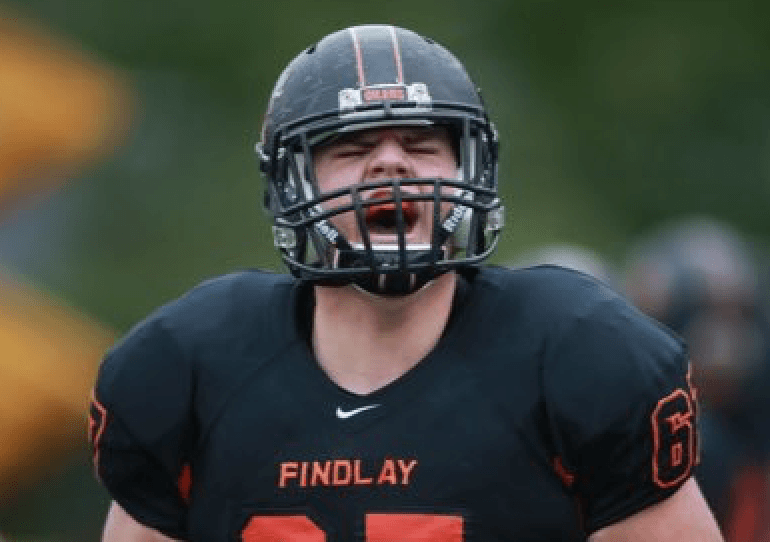 Christian Olmstead was a good offensive tackle at the college level for Findlay, he will likely be moved interior at the next level. I am from Florence, Kentucky. It is located about 10 minutes south of Cincinnati, Ohio. I love the community feel of what we call the NKY. The NKY consists of Boone, Kenton, and Campbell Counties. It is its own little state it feels like. The community is just different than most places I’ve been. The answer depends on the time of the year. If it is off season, 1) strength and conditioning 2) film study 3) practice. Preseason is, 1)practice 2) film study, 3) strength and conditioning. In season it is, 1) film study 2) practice 3) strength and conditioning. I worry not being good enough for those who depend on me. They are important to me and I would feel like a failure if I wasn’t successful for them. I was unable to get a division one scholarship. I was told I wasn’t good enough. I took it and used it for motivation and used it make me the best player I could be. I am better now than people I graduated with that got division one scholarships. It was the best thing that could happen to me. My desire to always be better and willingness not only hold myself but also my teammates accountable. My competitive nature and wanting to win at everything. I would be pursuing a master’s program through a graduate assistant ship at some university as a football coach. I would reevaluate my life after I get my master’s degree on where I would go next. If I have a good thing with coaching then I would stick with it. If not I would apply to medical school. Family member. I would do anything for family. If I consider them family then I have their back no matter what. I suffered a serious foot injury my spring semester of my sophomore year. I used my connections I made in high school when I shadowed several doctors and got into contact with a top foot surgeons in America to fix my foot. I was able to recover in time for my Jr campaign which took 4 months when a normal recovery time is 8 months to a year. I played at max 80 percent my Jr year and probably should have red shirted but my team needed me so I did what was best for the team and played through the season on a bum foot. After our second round defeat in the 2017 playoffs, I got selected for a drug test. I delayed our departure by an hour. The last kneel down at #1 Shepherd Jr. year, clinching our first win in the D2 playoff in school history. I have a tie between my cerebral ability and my ability to react off the ball faster than most. My grandmother. I was extremely close with her. I loved spending time with her and would do anything for another day with her. AJ Green. He is a top tier receiver and has done so much for the Bengals and it all goes under the radar due to lack of winning in the jungle. Respected. It shows my true colors instead of others opinions. Reuben Foster. It is my understanding that the women involved in each case were lying about being beaten in an attempt to take advantage of him. I feel for a guy that has done nothing wrong as far as I know unless something has developed that I’ve missed. I love to win. Hate takes to much energy that could be put to things that are more productive.